Railpictures.ca - Stephen C. Host Photo: The Southern Ontario Railway is seen working In the shadow of a giant, in this case, Stelco. The building in background is all that remains of the “D” Blast furnace complex, most of which was demolished in the early to mid 2000′s (which would have stood at left). I’m not sure what this structure is used for, but it’s still there today. This was back when you could drive back into some of the port lands, as long as you didn’t get caught by port patrol. It was all fenced off around 2011. Corrections welcome. | Railpictures.ca – Canadian Railway Photography – photographie ferroviaire Canadienne. 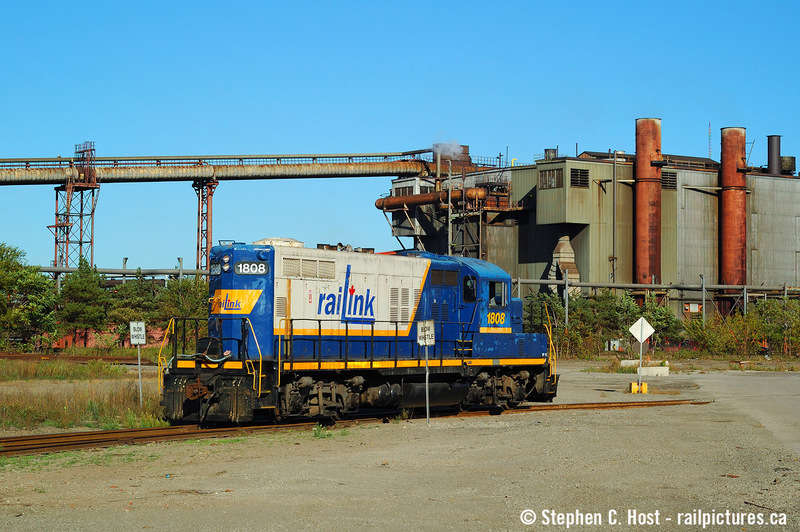 Caption: The Southern Ontario Railway is seen working In the shadow of a giant, in this case, Stelco. The building in background is all that remains of the "D" Blast furnace complex, most of which was demolished in the early to mid 2000's (which would have stood at left). I'm not sure what this structure is used for, but it's still there today. This was back when you could drive back into some of the port lands, as long as you didn't get caught by port patrol. It was all fenced off around 2011. Corrections welcome. Always loved that paint scheme! Not to mention the colourful history that unit had.